Radosław Wojtaszek is Poland’s no. 1 and one of the top 30 players in the world. The highlight of his career so far has been beating World Champion Magnus Carlsen and then world no. 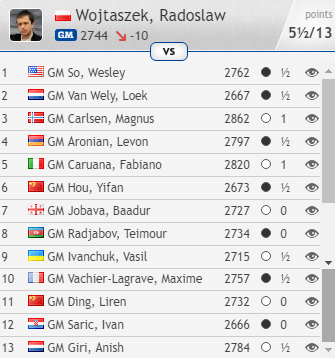 2 Fabiano Caruana in the space of three rounds in the 2015 Tata Steel Masters. In a recent interview he talks about what went right, and then wrong, at that tournament, and, as the husband of Russian Grandmaster Alina Kashlinskaya, he talks about men and women in chess. The interview took place in the weekly female “Wysokie Obcasy” (High Heels) supplement to the major Polish newspaper Gazeta Wyborcza. Interviewer Jerzy Ziemacki therefore focussed on questions that might appeal to a general (and even female) audience, but there was plenty for chess fans to enjoy. Two million people play chess in Poland. Are you the best? Each chess player who plays in a tournament gets a rating from the international chess federation FIDE. Currently I have the highest of all Poles: 2716. That makes me 33rd in the world. I want to join the Top 10, but that’s hard. The best at chess are the Russians, Americans, Chinese and French - also the Indians, because chess comes from India, and the inhabitants of Armenia, where chess is the national game, a communal obsession and an obligatory subject in school. In the 21st century Armenia has produced dozens of grandmasters and won gold medals at the chess Olympiads. Poland has only won gold once, before the war. In 2015 you beat the current World Champion! 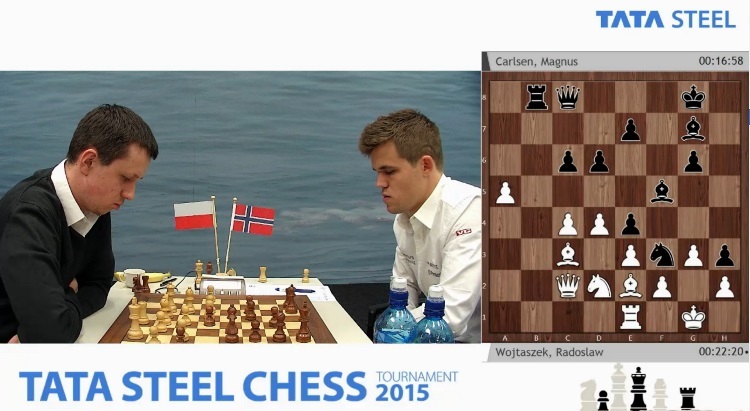 Magnus Carlsen from Norway was already playing with a flash of genius when he was a 13-year-old. He beat Garry Kasparov, a chess legend (Carlsen actually drew their 1st game – still a sensation). Kasparov was later the personal coach of the boy hailed as the “Mozart of chess”. The student outgrew the master. Today the great Carlsen is 25 years old. He won a World Championship match. He triumphs in the majority of tournaments. For chess he’s like Michael Jordan for basketball or Tiger Woods for golf. I beat him during the Dutch tournament in Wijk aan Zee. That was the best day of my chess career. What happened on the chessboard? You could say that Carlsen threw himself at me. He played the so-called Dutch Defence – fittingly, as we were in the Netherlands. He probably overdid it, though, and I got a better position by move ten. The maestro suffered in the middlegame and lost in the endgame. I played calmly and didn’t look for spectacular combinations. In time trouble the Norwegian sacrificed a piece. I won, and it wasn’t an accident. After the game we had a relaxed conversation. After that wonderful victory did you win the whole tournament? The tournament lasted two weeks. On the following days I won another encounter but unfortunately I then broke down. I started to lose. At the halfway mark of the tournament I felt that it wasn’t just my head that was tired (analysis, calculation, variations) but also my muscles, arms and neck. I was well-prepared theoretically, I knew my opponents’ strong and weak points, openings and endings, but I lacked energy. At the top level you have to be able to sit at the chessboard for five or six hours, fully focussed, under huge stress. That tournament wasn’t among my most successful – my body let me down. But after all chess is a mind sport, not a physical one. A chess player’s mind and body should be in harmony. The majority of professional players take care of their physical condition just as they do their intellectual form. After returning from the tournament in the Netherlands I started to run 8-10 km three times a week. I go to the pool regularly. Recently I’ve been working with physiologists from Krakow’s Academy of Physical Education – those who deal with Agnieszka Radwanska, and now also me. I appreciate how important it is in chess to have an appropriate diet and lifestyle. Apart from working daily for many hours you also need to rest, relax and sleep. During a game can you drink, eat or get up from the table? During a game you can drink. Food is allowed, as long as it doesn’t interfere with your opponent thinking. I usually have a banana or nuts with me at the chessboard. You can get up from the board and walk around the playing hall. From the stories of old colleagues I know that in socialist Poland chess and alcohol went together, unfortunately. In the evenings the players would drink vodka and analyse blunders in the games played that day. In the morning the players woke up with a hangover or still buzzing. Today that’s pretty unlikely. Players avoid stimulants and fewer and fewer of them smoke cigarettes. Does illegal doping exist in chess as in other sports? There’s a whole list of banned substances. Topping the list are beta blockers, which allow you to avoid stress and feel mentally at ease. The greatest aid for a chess player would be a computer. That’s why at tournaments they ban all kinds of technological devices: telephones, tablets, chips. The computer calculates variations much faster than a person – and there’s a lot to calculate in chess: two kings can be placed in 3,612 ways, adding a pawn to the board raises that figure to 167,248 legal positions, two pawns and two kings can be placed in seven million ways. With 32 pieces and pawns the number becomes astronomical. Some say the computer has killed chess. Is everything known? Computers have revolutionised chess. It’s a game based on logic and mathematics and we find ourselves at a moment in history when it’s almost impossible for a human to beat an artificial intelligence. Back in the 90s the World Champion could play on a level footing with computer programs. Now computers are too strong to compete with, but ideal to work with. Our training looks as follows: we sit with a laptop and analyse games – often our own games, because it’s good to learn from your mistakes. I don’t agree with the claim that chess has died. Does each educated chess player also know the games of other players? Of course. You need to be an erudite, to know historical games: Paul Morphy from the 19th century, Alexander Alekhine from the 20th. Each game played at a high level teaches something of interest. That’s why it’s so important to analyse games played. For many decades the World Champions were Russians, which was partly because Moscow had a gigantic archive of games. To gain access you had to be an accredited USSR chess player. Today similar archives fit on a single CD. I use online chess databases and I’ve got access to everything. How many moves ahead can you calculate? Without computer assistance. About ten. However, contrary to appearances, chess isn’t just based on calculation. One old chess master used to say that he plans only one move ahead – he puts a piece on the best possible square. That piece then operates well in the subsequent moves. 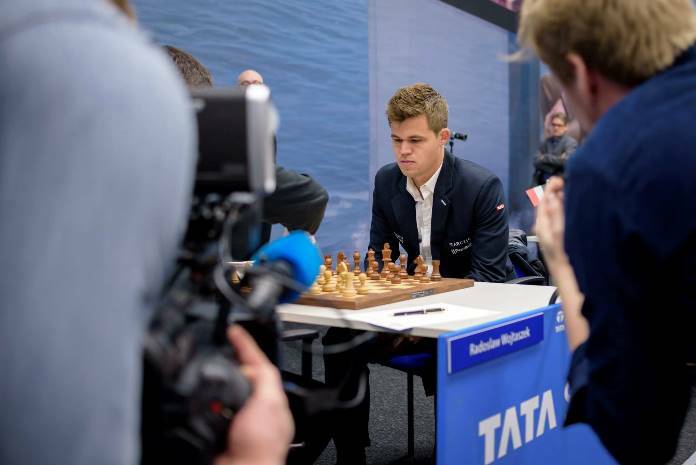 I noticed that Magnus Carlsen’s playing philosophy is to make moves that are good enough rather than the best. Making the best move again and again absorbs a lot of time and energy. The genius is economical: he plays 30 good moves and two excellent ones. It works. I think that principle applies not only to chess. When did you first deliver mate in your life? How did it start? I was four years old when I started to play chess. My mother teaches French in school and we were invited to France by her acquaintances. As a present for our hosts’ children my parents bought a chess set. For a while that was lying around in our home in Kwidzyn. I reached for the box, but didn’t open the present. It was only in France that it was unpacked and we started to learn the moves there. I really liked the game. When we returned to Poland my father took me along to the chess club. My first teacher and master was Marian Wodzisławski, a trainer from Kwidzyn. Your first success was in the Polish Championship? At the age of six I won the Polish U7 title. I couldn’t yet read fluently, but I already played well. At that Championship many of the children drew lines and squiggles rather than recording the moves of the game. I was also childish. At one tournament I resigned a game because my favourite cartoon had started on the television. I have a lot of photos from my childhood where I’m sitting at the chessboard and my feet don’t reach the ground. Or I’m giving a 20-board simultaneous display although I’m only just over a metre tall. For as long as I can remember chess has given me pleasure. I’ve combined work and pleasure. Was it worth choosing the career of a professional chess player? Thanks to chess my career is unusual. Even when I was still in primary school I’d started to travel to tournaments all around Poland. I got the chance to travel abroad and at the time each such trip was an adventure. The opportunity to see the world seemed to me – and still seems – very attractive, and I got to see the world playing chess, my favourite game, not to say my favourite activity. Even if I hadn’t become a grandmaster I wouldn’t have regretted the time devoted to chess. The royal game helps you grow, even if you only treat it as an entertainment. It teaches logical thinking and decision making. When a woman hears that you’re a chess player what does she think? No doubt he’s intelligent, no doubt he’s good at mathematics and has the slow reflexes of a chess player. I never had any trouble with maths, but I chose history for my school-leaving exam. I know chess players who are wildly intelligent and not very intelligent, wise and stupid, educated and uneducated. I don’t consider myself overly clever, but I don’t consider myself stupid either. When it comes to the reflexes of a chess player, though, then that’s a bizarre stereotype – that they’re supposed to be slow. You need to have good reflexes in chess. At times a game lasting many hours is decided in the final seconds – if someone’s time runs out they lose. Do professional chess players play in suits and ties? Chess is a parlour game where a certain dress code applies. No-one turns up to an important tournament in shorts. The outfit of a chess player must always be neat, clean and elegant. At the top level suits are often obligatory. For important tournaments the dress code is specified in the regulations or contract and I know some players negotiate on whether they can wear a sports jacket or come without a tie. There are also problems with shoes and accessories. It’s worth dressing sensibly. You need to remember that it’s important to be comfortable to play, while too tight a collar can get in the way. Recently there was a film Pawn Sacrifice on the life of World Champion Bobby Fischer. I saw that film during one of the tournaments in Europe. 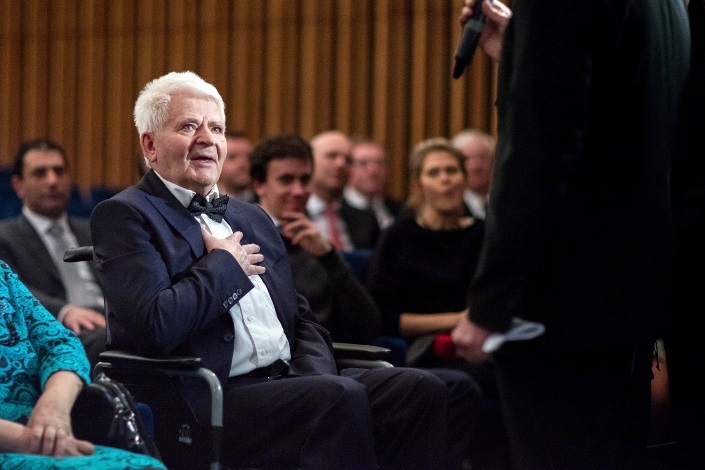 Present at the screening was Boris Spassky, against whom Fischer won a historic World Championship match in Reykjavik. Thanks to Fischer chess became fashionable in the USA in the 70s. In the film, though, you can see that the grandmaster’s private life was unhappy. He was tormented by fears and paranoia, thinking that he was spied upon by the USSR and the FBI. He had Jewish roots but became an anti-semite. He lost touch with reality. At the end of his career he became a tramp. A huge mental effort can have side effects. Are you not afraid of mental illness? I’m not afraid, although I’m aware of the risk. I hope I’ll never be as lonely as Fischer. 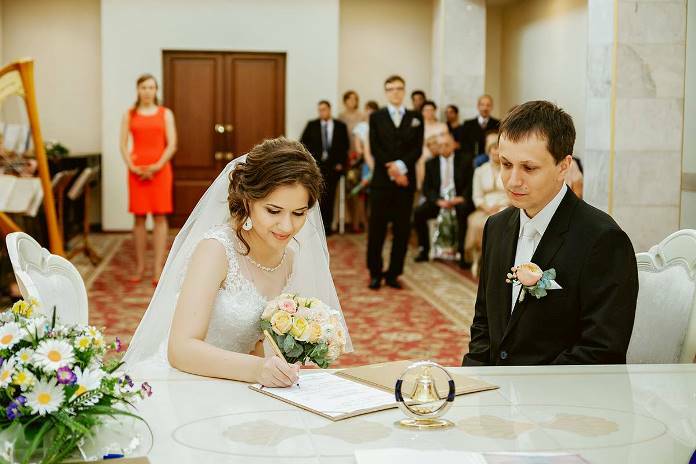 I just got married and I live with my wife Alina. We moved to Warsaw – for me that was from Poznan, while Alina came from Moscow. My future wife used the photo as her Facebook profile image. She said she turned out well, but I was redundant on the photo. That’s why she cut me out and left only herself. It’s funny. Today we’re together and we have a whole album of joint photos. We’re planning and organising our new life. We’ve got a lot of things to sort out – from passports to renovations. I must admit that love has seen me fall in the chess rankings, but I’ll soon get back to top form. For a chess player it’s important to have stability – therefore marriage, if successful, peaceful and well-chosen, turns out to be beneficial for a player. Two grandmasters under one roof. Do you play against each other? I’m not with my wife because she’s a chess player, but thanks to the fact that we both play professionally we get along well. She understands the dilemmas of a chess heart. When I lose a game I think about it for a long time. No easy consolation helps: don’t worry, go to the cinema, relax! I need time, and my wife knows that. Occasionally we play chess at home, but rarely. Maybe that’s because I almost always win. From time to time we analyse some game, but in general we try to use our time spent together differently. We don’t have so much of that time as we travel to tournaments, living out of suitcases. Who plays better at chess – women or men? The chess elite is almost entirely made up of men and you can wonder why that is. I think that sociology rather than biology is decisive. The problem for many promising female players is a lack of prospects. A female chess player starting out on a chess career can rarely e.g. in Poland, count on making decent money. She has to fight against financial problems. It’s no surprise that many talented women choose studies, a house, a job. They want to have a good life and not one full of sacrifices. When it comes to men it’s different. Money is there for the best. Next year you’ll turn 30 – is that a good age for a chess player? The best. In this sport your form peaks at about your 30th year. At that point you can combine all of your acquired knowledge and experience with the brain power and body of a young person. Young players are often too nervous and emotional. Over time a person matures and becomes calmer. After 40 you can still play very strongly, but becoming World Champion is tough. Many of my older colleagues have become chess coaches or international arbiters. Perhaps I’ll also go down that road. One thing I know for certain – my life will always be connected to chess.